Dear Architecture STYLE Editor We are TADASHI+NAOKO,Japanese Architect and the president of TRES-ARCHITECTS OFFICE. 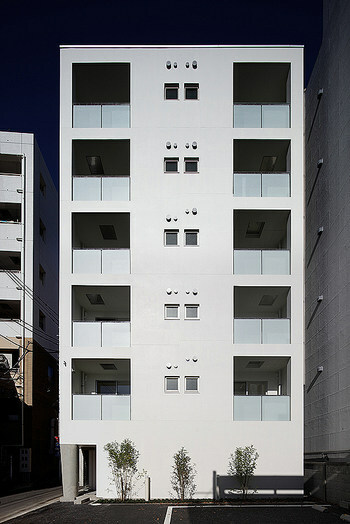 We had a design of the apartment ”Apartment house in front of Zelkova” in Suginami, Tokyo. This apartment faces a lot of traffic trunk road of the north side, and the low housings of the south side. "Dynamic" and "static" is located in between. For facing north, it isn't exposed to the direct sunlight, high noise of the trunk road is not attractive to the living space. However, in this area, Zelkova trees grow well, those give people a sense of the season. So, we make the opening actively, and residents to visually feel the season. In each dwelling unit those have no partition wall, and are long rectangular in the north-south direction. So it links "Dynamic" to "static", and at the same time, the path of the wind can be ensured. In each dwelling unit of this Apartment, the movable furniture with the function of partition wall can create free space, and this apartment is applicable to various needs of residents. Consequently, this apartment is sustainable.